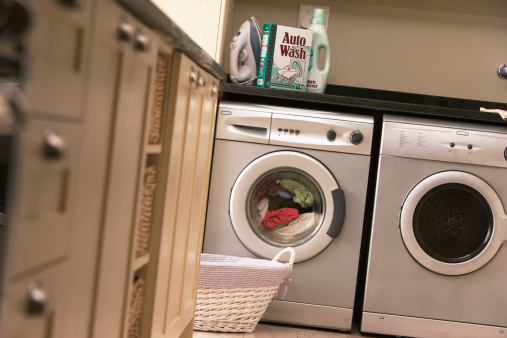 If your washing machine has lost its shimmy, then you may have an agitator on the fritz. A misaligned or noisy agitator is attempting to communicate with you that it needs a good looking over. Getting to the root of a raucous agitator takes a bit of time and knowledge of the machine to get it back on track. There is a debate about whether or not an agitator is needed in a washing machine. Many modern machines don't have an agitator and clean clothes adequately without the twisted middle pole that churns clothes. An agitator is curved and runs the length of the tub of the washing machine. It assists in rolling the clothes to get the soap to do its job while lifting stains through the mixing motion. They have a shorter wash cycle than the washing machines that eschew an agitator component. They also tend to be less expensive than the washing machines that don't have agitators. The washing machine is a workhorse in the home. It gets the grass stains out and lets the whites shine bright when the correct detergents are put in place. The agitator in a washing machine can also break down when too much heavy fabric, such as denim or dense blankets, is stuffed into the hard-working unit. The fins can crack or the tiny parts that connect the unit to the machine and its different parts together can fall out or slip. The small coins, bobby pins, toy parts and more can wedge underneath an agitator and cause problems over time. Clean out under the agitator after each run of clothes and occasionally inspect the head for loose or cracked parts. First, remove any items from the tub of the washing machine before getting down and dirty with the parts of the machine. Even though they may be stuck to the side of the wall, you'll need the room to get to the agitator as well as reduce injury to fingers as you find your way around the center of the tub. Always look over the manufacturer's instructions before you begin breaking down any appliance. If the top of the agitator spins out of control but doesn't complete the spin for the whole unit, then it could be a problem with the component's dogs. Check the agitator dogs, the tiny cams that are found in the top half of the washing machine's agitator. These control the movement of the agitator. If the agitator makes more noise than usual, the direct-drive washer clutch could be the culprit.